Xiaomi is all geared up for its first major launch in 2018, and the company is promising massive surprises at the event. But it seems like Xiaomi’ surprise has leaked online. As per various teasers and hints from Xiaomi and Flipkart, we already got an idea that the Xiaomi Redmi Note 5 is coming out tomorrow as an all-rounder tag. The surprise Xiaomi is teasing the Redmi Note 5 Pro, which is world’s first smartphone with Snapdragon 636 SoC and yes, we’re getting it first ahead of several other countries such as China, United States, etc. 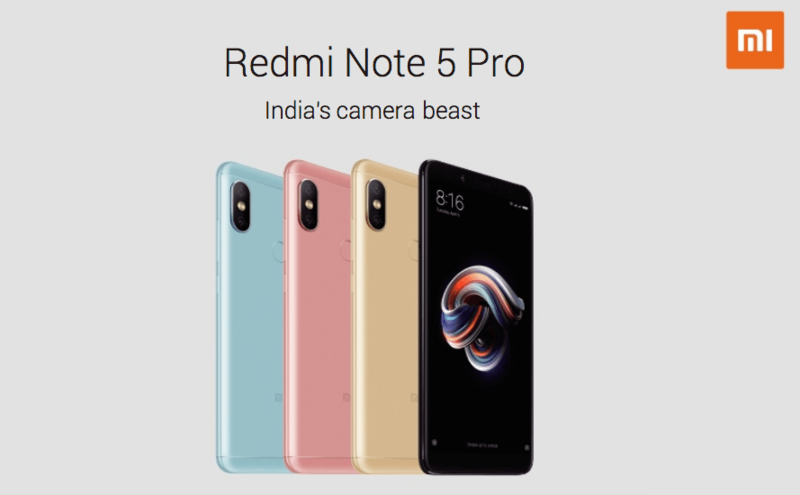 Complete details about the Redmi Note 5 Pro and Redmi Note 5 have surfaced online today, courtesy of the company’s official specs page. The device will be powered by the Qualcomm Snapdragon 636 chipset and comes in 3GB, 4GB, and 6GB of RAM variants. Storage in the smartphone goes up to 64GB with the 3GB RAM variant getting just 32GB storage. But there will be a microSD card slot for storage expansion, and the phone supports dual SIM cards. The front of the phone will be dominated by the 5.99-inch Full HD+ display which gets up to 450 nits maximum brightness and has 2.5D curved glass. The phone comes with on-screen navigation keys. The fingerprint scanner will be present at the rear of the phone and the phone boots MIUI 9 based on Android Nougat and not Android Oreo. This entire package will be backed by a 4000mAh battery, and the sad part is the phone still comes with a micro USB port and lacks fast charging support. 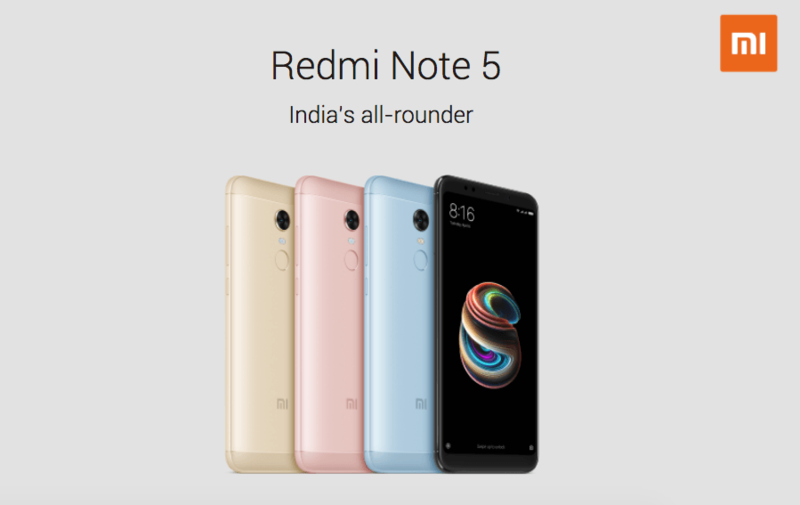 Coming to the Xiaomi Redmi Note 5, it will be touted as ‘India’s All-Rounder.’ This is the same Redmi 5 Plus smartphone which Xiaomi launched a while back in China. As rumoured, the Redmi 5 Plus is coming to India as Redmi Note 5 with the same Snapdragon 625 chipset, sadly. The Redmi Note 5 will have the same 5.99-inch Full HD+ display and will arrive in two variants with 3GB of RAM and 32GB of internal storage, 4GB of RAM and 64GB of internal storage. It uses a single 12MP sensor at the back, followed by a 5MP sensor on the front. Rest of the specifications are similar too- Android Nougat based MIUI 9, 4000mAh battery with no fast charging support and 180grams of weight. Both the phones will be available in multiple colour options- Black, Gold, Rose Gold and Blue. What we don’t know is the pricing. The Redmi Note 5 Pro would surely start around Rs 15,000 considering the specs it has. But bet on Xiaomi to go extremely aggressive on the pricing aspect. What should be the price according to you? lack of usb-c is disappointing. Otherwise for the price point its ok. My father still uses his Redmi Note 3 and its a great device. I wish Xiaomi would launch a model with SD660 or SD670. Currently, Mi Max 2 is the only Xiaomi phone under 15k that supports Quick charge. I use it every day and it is as fast as OnePlus Dash charge. This is a life changing feature, extremely practical and helpful in emergency. It should be on every phone. MI A1 and Moto G5 Plus are the devices that support fast charging!!!! !